Water pumping-out by the Rojana Industrial Park authority around Nikon (Thailand) Co., Ltd. has completed on November 26. Following this development, we are putting all our energy into restoring infrastructure and production equipment of the factory aiming for some part of factory operation to resume from January 2012. Alternative and limited production at our partner factories in Thailand has started earlier than expected, and we have started shipment of certain digital SLR cameras and interchangeable lenses since November 30. The impact of the flood to our business performance for the financial period ending March 31, 2012 is estimated, within the scope of our current findings and understanding, to push down net sales by 65 billion yen and operational income by 25 billion yen due to sales opportunity loss. While this estimation remains unchanged from our announcement on November 4, we assure you to immediately advise new findings once it is judged there will be an important change for it. We are continuing our minute investigation on the damage to the buildings and production equipment/tools from the flood. We have set up support and recovery system under the Emergency Headquarters for Disaster Control headed by the president and continuing our endeavor for recovery and normalization of production as early as possible. Our plan to resume production of digital SLRs and interchangeable lenses to the normal level of volume by the end of March 2012 remains unchanged. DxO Optics Pro 7 is now shipping. B&H is accepting DxO Optics Pro 7 preorders. Note: Until the proper discounts for version 7 are in place, just order v6 and take the free upgrade option promised by DxO. Scuba diver Markus Thompson discovered a Canon EOS 1000D at the bottom of Deep Bay, BC. The camera, being undersea for a year, was of course a complete loss. The pictures contained on the SD card, however, were not. With the help of the Google+ along with some idetifiable details in the recovered pictures, Marc was able to locate the owner. "This update provides key fixes and improvements in performance, metadata handling, the Adobe Drive Connect UI, and other areas." I lowered the prices on the remaining used lenses and other gear I am offering for sale in the cUSA. Francesco Marzoli’s Camera Raw 6 User’s Guide is available for free download from X-Rite. Canon USA Professional Services (CPS) has a new website. I'm not sure how long this has been up, but ... the new site has a much more "professional" look to it. LightingDiagram.com allows quality lighting diagrams to easily be created and edited. The diagrams can be downloaded free for personal use. Note that Internet Explorer is not supported. Thanks to its unique expertise in composite materials, Gitzo developed a new High Performance basalt fibre tube. The new tube comes from a radical innovation of the Poltrusion process, the aerospace technology used by Gitzo to manufacture its composite tubes in one single step, starting from the raw fibres. Fibres are wet in the special resin and then pulled through a high temperature core that generates the tube as we know it. This works perfectly with 6X carbon fibre tubes, while basalt fibres absorb a smaller quantity of resin and this reduces tube density and performance. To overcome this physical limit of basalt fibres, it has been developed a new technology (DRI) to boost a higher quantity of resin into the fibres and increase the tube performance up to 22%, depending on the tube diameter. Besides the High Performance tube, the new Gitzo Basalt Collection offer new sizes and a new look. Basalt tripods are available in Series 1 - 2 and 3 in standard and compact height. The range also includes a new monopod and a microphone boom, both in a convenient 6 section compact size. The new basalt introduces a new colour scheme: black and flame orange, inspired by the basalt itself, a black rock that comes from the Earth lava core. The basalt collection is completed by three centre ball heads in the new black and flame orange colour scheme to perfectly match basalt tripods and monopod. Basalt fibre tripods, monopod and boom come with the same features of the top of the range 6X models, such as G-Lock, ALR, Ground Level Set, Power Disk, third ground level leg spread and self locking feet among the others. Basalt tripods come with a smart Gitzo display cleaner and a convenient anti dust bag for storage and packing. Utterly new lens with an integrated microprocessor compatible with Nikon DSLR cameras. Kraków, November 25th 2011 - Delta Company, the sole distributor of Samyang products for Europe is about to release new lens - Samyang AE 8mm 1:3.5 Aspherical IF MC Fish-eye CS with the Nikon mount. This new, improved version is to replace the previous model without a microprocessor. Samyang AE 8mm 1:3.5 Aspherical IF MC Fish-eye CS has been fitted with an electronic circuit, and just like other AE models allows for full control of exposure parameters from the camera level, and makes it easy to use i-TTL flash automatics. Owing to the integrated microprocessor, the light measurement system is effective in all photography modes and for all types of Nikon DSLR cameras. AE line additionally records exposure parameters and focus value in the Exif format. Samyang 8mm 1:3.5 Aspherical IF MC Fish-eye CS is the high-class wide-angle lens designed for DSLR cameras with APS-C/DX sensor. This really is a sophisticated optical construction based on ten lenses arranged in seven groups, including one hybrid-aspherical lens which reduces chromatic aberration level. All lenses are covered with multi-layered, anti-reflexive coating of new generation. Optical parameters are thus of the highest-possible quality. 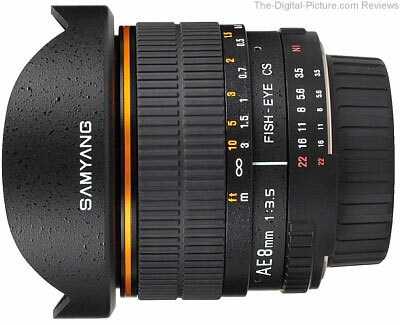 Samyang AE 8mm 1:3.5 Aspherical IF MC Fish-eye CS lens is covered by 36-months warranty. Looks like humor is infiltrating the customer reviews of the Sigma 200-500mm f/2.8 APO EX DG Ultra-Telephoto Zoom Lens at Amazon.com. I've said this before, but I've never meant it more. Today, the USA celebrates the Thanksgiving holiday. While this holiday celebration is typically a time spent with friends and family, it is also a time to reflect on how blessed we are and to express "thanks". And one of my hearty expressions of THANKS goes you. I have greatly enjoyed meeting (virtualy) and getting to know so many of you. And without you, this site would not exist - It's really as simple as that. The site's support comes soley through your purchases made using the links on this site and through your referrals of others to the site who do the same. As you do your Christmas shopping this year, I would be grateful if you kept this site in mind. Most or all of the retailers below here have a Black Friday/Cyber Monday deal page(s) that will list all of their bargains. Experience no lines, no traffic and no parking hassles. Permalink: Wishing You and Yours a Very Happy Thanksgiving!